Foot problems affect over half the population. Prevention, assessment, diagnosis and treatment require expertise and practical skills. Foot complications can be reduced and even avoided through thorough foot health education. The Canadian Federation of Podiatric Medicine and the Ontario Society of Chiropodists encourages all members of the public to have their feet examined as a precautionary measure to promote foot health and overall well being. Chiropodists may be the first to identify general medical pathology such as diabetes, vascular changes, and rheumatologic problems, severe skin problems such as psoriasis and skin cancer. Studies have shown that with regular treatment from a Chiropodist/Podiatrist, many elderly patients remain ambulatory; active and in their own homes for a longer time period. Active individuals of all ages also require the professional help of a Chiropodist/Podiatrist to prevent and treat various foot complications. are viral infections of the foot and are caused by the human papillomavirus (HPV). The invading virus can infect the skin on the sole or toes of the foot, producing a lump or outgrowth. These lesions often have black dots in them due to the capillary vessels supplying the area. Warts are painful when squeezed and if present on weight bearing surfaces, are often painful to walk on. Treatment varies with the size, severity, location of the plantar wart in addition to the patient’s health status. Common treatments may include destruction by freezing, heating, laser, surgical removal or other treatments. Please speak with the Chiropodist for further details at (905) 540-FOOT (3668). are thick and hard skin due to repeated friction, pressure, or other irritation. Calluses are diffuse and generalized, while corns are more distinct and localized. The formation of corns and calluses may be due to abnormal foot function and increased load on the tissues, over-stresses the skin. There may be some conditions that mimic or have similar appearances to corns and calluses. The best plan of treatment is to assess why there is high pressure and correct the cause. Otherwise, pressure will still remain even when the thick skin is reduced. If you are in pain and find it difficult to walk because of thick skin, have your feet assessed by the Chiropodist/Foot specialist. is a very common condition seen in older population and in immune compromised individuals. In the most common cases, the nails become yellow, crumbly and thickened and may be painful when wearing shoes that press against the nail. The fungus residing in the affected nail can easily spread to adjoining toenails and skin, creating an infecting cycle from nail to skin and vice versa. There are different types of fungal nail infections and stages and the sooner a fungal nail is treated the greater the success rate. If you see a change in your nail texture, colour and/or thickness, make an appointment to see the Chiropodist/Foot specialist at (905) 540- 3668 to get treatment. is common fungal infection of the skin. About 20% of the populations are likely to be affected at some time or other during their lives. The fourth toe space is a common area to be infected. Whereby the toe space will become macerated (white and soft) and can develop into a fissure. There may be itchiness associated with the area. The fungus can be confined to the fourth toe space or can spread to other areas of the foot. If left untreated, fungus can spread from the toe space onto the sole and sides of the foot, and chronic forms of foot fungus are naturally difficult to eradicate. occurs when the toenail irritates skin surrounding the nail. 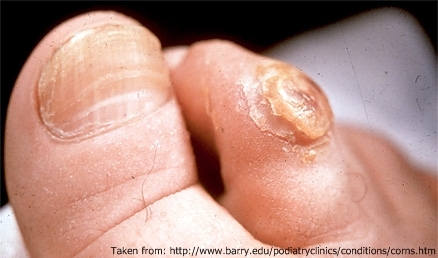 This common nail condition can occur within any age group and often is the result of improper toe nail cutting. Depending on the stage and how long the condition has been present, the area may be very painful, swollen, and warm. In addition to the mentioned symptoms, if there is presence of discharge/pus, this is a strong indicator of an infection. In severe stages, there may be abnormal tissue growth that folds over the nail and readily bleeds when pressure is applied. The more severe cases often require surgical intervention, which can be performed in the clinic, under sterile environment. Please contact the clinic for an assessment at (905) 540-3668.
are opens sores in the skin. The wound may be superficial or deep, penetrating to underlying bone. As with any break in the skin barrier, wounds can become infected. This added risk can increase the chance of limb amputation in high risk patients. When you book an appointment to meet with the Chiropodist, she will carefully assess and develop a management plan that is patient centred. Predisposing conditions that impair the ability of the tissue to heal from damage will be addressed. If these factors are not addressed, a chronic wound will take months to years to heal. If you have diabetes, vascular problems or have a history of slow healing sores and notice a wound that isn’t healing, contact the clinic immediately for an appointment. When wounds are left unrecognized and unmanaged in a high risk patient, this can spell disaster. is a condition in which the arch of the foot collapses when weight bearing, whereby the majority of the sole of the foot comes in contact with the ground. Not all individuals with flat feet have problems. However, many suffer from pain in the foot, knees or low back due to instability and increase strain on the joints and ligaments. If pain is left untreated because of flat feet, this can lead to further disability with advancing age and inactivity. 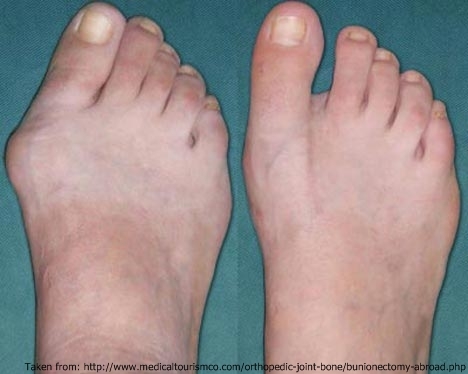 is a condition of the foot characterized by an abnormally high arch when weight bearing. This condition can be associated with neurological impairment, boney deformity of the leg and hind bones and tight muscles. Individuals with rigid high arched foot have reduced shock absorption and often have pain under high pressure areas such as the heel and balls of their feet. Toes deformities such as claw or hammer toes are commonly associated with this type of foot profile. is a bone growth on the bottom inside hind bone. It is believed that because of continuous over pull of the plantar fascia away from the hind bone, new bone is laid down. Heel spurs are visible with X-ray of the foot and can be associated with plantar fasciitis. is a boney digital deformity of the big toe. There is a thickening of the first metatarsal joint, whereby the toe is shifted towards the second digit. In severe stages the first toe may overlap of the second toe. Common problems associated with bunions are calluses, pain and difficulty in finding proper footwear to accommodate for the deformity. is a common painful inflammatory condition of the plantar fascia, a connective tissue that originates from the bottom aspect of the heel bone and attaches to the digits. Patients often feel pain at the bottom of their heel and with greatest intensity with the first step in the morning and/or when standing up after resting. It can be associated with overuse or acute foot injuries, occurring in both high and low arch foot types. Treatment can include stretching exercises, custom foot orthotics, steroid injections, bracing and for severe cases, surgery. Note however, non-operative treatment is usually successful. Sprains and strains of the foot and ankle complex. Individuals with chronic disease such as diabetes, heart disease, circulation impairment and arthritis are at a higher risk for foot problems. In addition to chronic diseases, individuals who have: loss of feeling in feet (neuropathy), pain in legs while walking, changes in shape of feet and previous foot ulceration and amputation are recommended to see a Chiropodist for an assessment to prevent foot disease. Visitors should not rely exclusively on information provided on this website as professional medical advice, diagnosis, or treatment. The contents on this website are meant for general medical information.